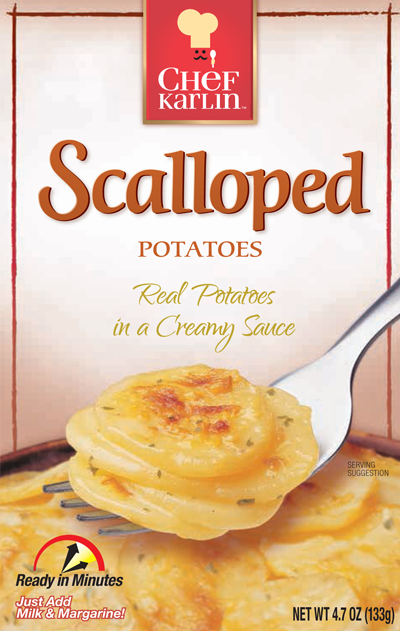 Ingredients: Potatoes*, Enriched Bleached Wheat Flour (Wheat Flour, Niacin, Reduced Iron, Thiamine Mononitrate, Riboflavin, Folic Acid), Whey (from milk), Salt, Partially Hydrogenated Soybean and Cottonseed Oils, Corn Starch, Monosodium Glutamate, Sodium Hexametaphosphate, Natural Flavor, Corn Syrup Solids, Cheddar Cheese (Pasteurized Milk, Cheese Cultures, Salt, Enzymes), Paprika, Sodium Caseinate (from milk), Annatto Extract (color), Parsley*, Spice, Mono- and Diglycerides, Paprika Extract (color). (Freshness protected by Sodium Bisulfite). In an un-greased 1½-quart casserole, combine 2 -cups boiling water, 2-tablespoons margarine or butter, ½-cup milk, potato sauce mix and potato slices. In a 2-quart saucepan, combine 2-cups hot water, 2-tablespoons margarine or butter, ½-cup milk, potato sauce mix and potato slices. Reduce heat; cover and simmer about 10 minutes, stirring occasionally, until potatoes are tender and sauce is desired consistency (sauce will thicken as it stands).